Philippine-Italian Association and Film Development Council of the Philippines present Mediterraneo (1991) by Gabriele Salvatores. Mediterraneo, starring Diego Abatantuono, Claudio Bigagli, Vanna Barba & Claudio Bisio, is an Italian film that won Best Foreign Film in the Oscars in 1992. 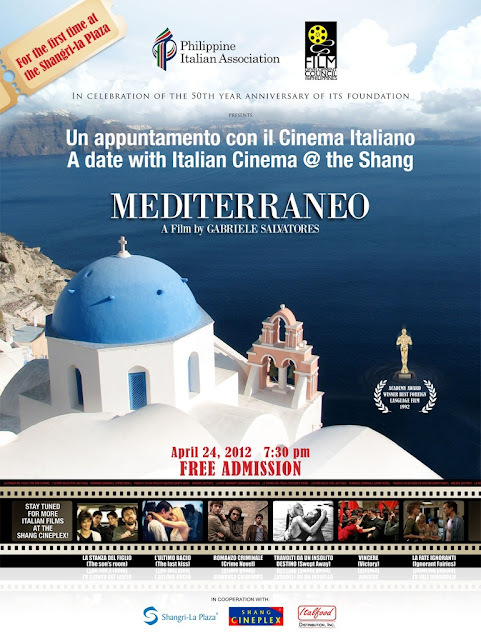 It is scheduled to be shown for FREE at the Shang Cineplex on April 24, 2012 at 730pm, but on a first-come-first-served basis. The cinema is located inside Shangri-La Mall in Mandaluyong City. To inquire about the tickets, please contact Ms. Marissa Ronquillo at (632) 815-1310 or 892-7253. It is the story of several Italian soldiers who are left to guard a Greek Island during the 2nd World war. The soldiers all come from different areas of Italy and different social backgrounds. Due to an accident they lose the use of their radio and the ship that left them on the island is sunk. They realise that no one elso knows that they are there and that they will have to fend for themselves. They search the island and gradually the local Greek population, who have previously been in hiding, reveal themselves. The soldiers gradually become assimilated into the Greek way of life. The humor comes from the diverse ways each of the characters chooses to cope with the situation. Finally, after some years, an Italian pilot lands his plane on the Island and tells them that Italy has changes sides and there is a civil war in Italy. Some of the characters are keen to return to the new Italy, that is expected to be full of opportunities, but others wish to stay on the Island where life is uncomplicated and idyllic. Eventually they are removed from the Island by the British. In the last minutes of the film we see the Island as it is today and the fate of the characters is revealed.